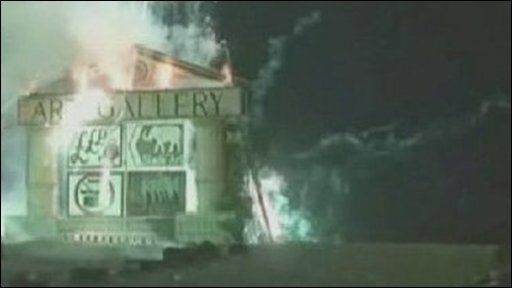 An effigy of an art gallery has been burnt in Hastings in protest against plans for the multi-million pound Jerwood project in the town. 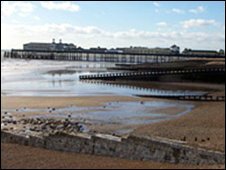 Under the plans, the Jerwood Foundation would build a gallery on the East Sussex seafront and invest up to £4m. But in a protest over local democracy, Hastings Bonfire Society said people would not be driven into accepting it. Hastings Borough Council has approved the plans. The Jerwood Foundation said it had "consulted widely". Bonfire societies across Sussex stage processions and fireworks in the autumn and traditionally burn effigies. Keith Leech, from Hastings Bonfire Society, said members were "not against this particular project as such". He said: "This is just another one in a long string of things that people are trying to foist upon us." But Hastings Borough Council spokesman Kevin Boorman said: "Hastings Old Town is unique in lots and lots of ways and I think it's good that people have strong local opinions. "I absolutely believe that this is right for Hastings Old Town. "Clearly, not everyone agrees with me, but let's have a proper debate." Alan Grieve, chairman of the Jerwood Foundation, said the plans had been "welcomed and supported" by the majority of Hastings residents and the council. He said the project would "make a major and unique contribution to regenerating an historic and important site close to the Old Town and the Fishermen's Heritage site". He added: "We have consulted widely and continue to meet representatives of local groups and the community. A public exhibition was held in May which was widely publicised. "We can listen but cannot please everybody." He said the gallery would offer an "outstanding collection" and the town would "benefit enormously".